The first floor contains the Mead Hall itself with its patrons, among them is Erich the Unworthy, a perpetually angry barbarian. Later, you can become the chieftain here and run your very own business. Go up the stairs in the northeast corner, and you enter a completely different area. The top floor is sub-divided into five bed chambers. A locked door on the northwest leads to Erich's bedchambers, holding an imprisoned missionary, Mirisa. To the northeast, there is the room of Bereditte Jastal, a Breton scholar and author who sells several unique books, such as Thirsk, a History. You can rest (free of charge) in any of these rooms, depending on your preference, on a bed, or a bedroll made of bearskin. All in all, Thirsk is a welcoming place, and certainly lives up to the name "A light in the wilderness". 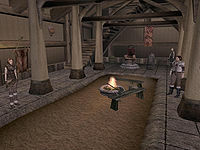 Outside to the northeast is the smithy of Brynjolfr. He sells Nordic silver weapons, minor armor, repairs your gear and has 600 gold. If you can bring him the required pelts, Brynjolfr offers to craft Snow Bear and Snow Wolf armor unique to Solstheim, which has substantial bonuses against the cold. Travel to Thirsk is restricted mainly to walking; the surrounding terrain is difficult and blizzards often drop visibility to a few feet. 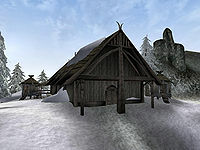 Divine Intervention from here takes you to Fort Frostmoth, Almsivi Intervention to Gnisis. Behind the main hall is a hollow stump containing several nice trinkets, among them the Ebony Arrows of Slaying. There is a small chance that a Confused Lunatic – a male level 55 Imperial Battlemage – spawns north of Thirsk. He turns into a Werewolf between 9pm and 6am. Likewise, the Wandering Lunatic – a male level 65 Orc Barbarian – is roaming outside the mead hall to the northeast. Between 9pm and 6am, he turns into a Werewolf. The age of Thirsk is inconsistently reported. The NPCs all claim that Thirsk was founded 500 years ago, but the book Thirsk, a History claims that Thirsk was founded 'approximately 100 years ago'. The latter is more believable, because it includes a list of Chieftains and the length of their reign, which total far less than 500 years. This location also appears in the Dragonborn expansion for Skyrim. Mead Hall Business: Run the mead hall as the new chieftain. * These NPCs suffer a scripted death at the conclusion of The Skaal Test of Wisdom quest.